Product code: R400 Categories: Sold Items, Sold Jewellery. 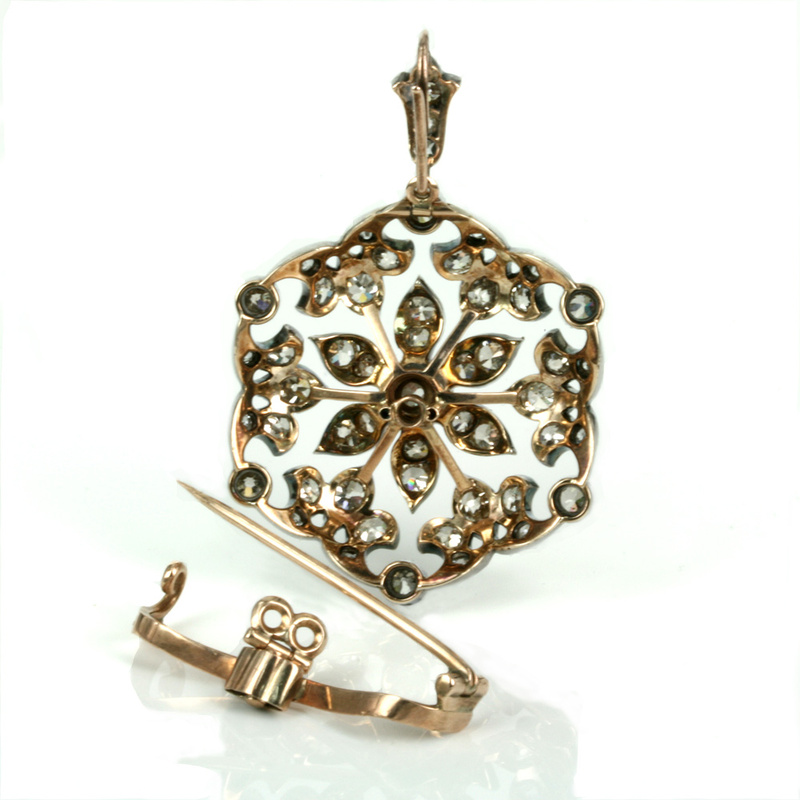 Dating from the Victorian era of the 1870’s comes this truly spectacular antique pendant that can so easily convert to a very elegant brooch brooch. The craftsmanship is incredible and it is amazing to think that this antique pendant was made over 140 years ago without the technology that we have today. Entirely hand made in 15ct rose gold and silver, this technique of putting silver on top was used as it was realised that the colour of the gold would artificially tint the diamonds yellow and at this time it would be about another 40 years until white gold was invented and platinum was not used in jewellery until around the same time as white gold in the early 1900’s. In total there are 53 old cut diamonds that were entirely cut by hand and all of these diamonds total a dazzling 6.09 carats guaranteeing that this piece no matter if it is worn as a pendant or a brooch will most certainly sparkle. Measuring 35mm across by 49.3mm or 52.9mm to the very top when the bail is attached, one of the incredible features of this piece is that when it is worn as a pendant, the brooch fitting at the back can be easily removed, or when worn as a brooch, the fitting reattached and the top bail easily removed. There is no doubt that this would have been painstakingly made by a master jeweller and this is one of the finest antique diamond pendant/brooches around.